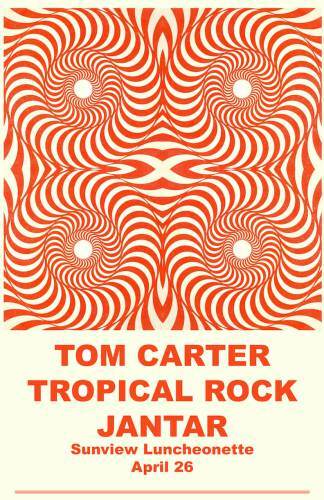 Next Wednesday, April 26, there will a nice show at the luncheonette -- Tom Carter, Tropical Rock (Ka Baird and Camilla Padgett-Coles), and Jantar. It will be an early show (school night! ), so I imagine Jantar will begin well before 8:00 -- probably in background-mood-music-for-cooking mode. But do come early for dinner, Forrest will make soup, etc., for everyone, and there will be free booze -- all the usual enticements. We can break out that good 99 cent-store rotating colored light, I'm sure. Pasolini's Canterbury Tales on VHS in the back. Yes. I hope you can make it!